In order to answer those questions properly and completely it’s important to understand how stressful a natural birth is on a newborn’s neck. When it comes to forcep or vacuum extraction the amount of pressure goes up to 90-120 pounds of pressure on the infants delicate neck. Such trauma may contribute to several painful conditions often found in babies.3 Symptoms can begin in the first months of an infant’s life and may plague a child throughout the early years. Early detection of any musculoskeletal distress may be beneficial. To make this seem real to you, imagine attempting to pull a 12 year old’s body through a mailbox by only pulling on their neck. It seems foolish but it’s really what is happening in a doctor assisted delivery. The tension and pressure on the delicate nerve fibers can create havoc on a newborns spine. 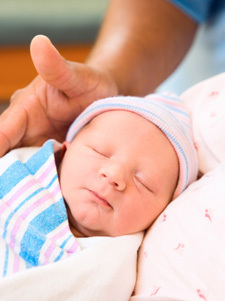 Research from Dr. Gutmann found over 80% of the newborns in his study had problems in the upper neck from the birth process that needed to be addressed. Birth trauma was the most common cause. Forceps delivery, vacuum extraction and even just normal birthing methods with a woman flat on her back rather than in the standing position where gravity can work, can be an extremely traumatic experience for the head and neck of a newborn that should be evaluated by a Chiropractor. If these problems go unaddressed they can often manifest to such things as colic, reflux, difficulty nursing, torticollis, ear infections, allergies and inabilities to get over the common cold. As a chiropractor, I’m not treating the above manifestations but rather the CAUSE of them with that being a misalignment (subluxation) and lack of movement with the spine.